One of the foundations of FBLA is community service. The central focus of FCCLA is the family. Both organizations encourage the development of individual and group involvement to improve home, business, and community. Berrien Middle School FBLA and FCCLA partnered together in a project that centered on family and community service. They sold lemonade and cookies to support the March of Dimes. FBLA and FCCLA members baked a variety of cookies for the sale. Chocolate chip, lemon, sugar, double chocolate, and peanut butter cookies were included on the menu. 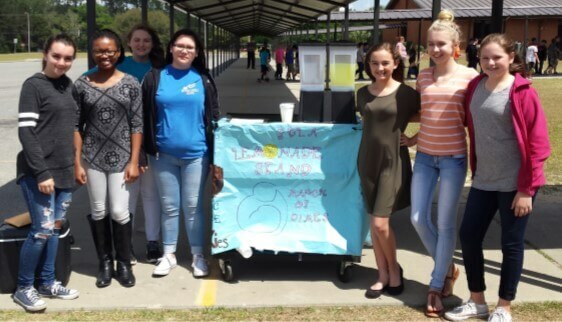 FBLA members also put their entrepreneurial skills to work by creating a lemonade stand. They designed and painted the signage for the stand and created the menu board. They also prepared lemonade and operated the stand during each lunch. The faculty and staff at Berrien Middle School also supported the March of Dimes by participating in “Blue Jeans for Babies” days. All staff members received a Supporter poster and dressed down to support this worthy cause. The profits received from the lemonade stand and faculty/staff donations will be presented to the March of Dimes. From polio to prematurity the March of Dimes focuses on researching the problems that threaten our children and finding ways to prevent them. Our local FBLA and FCCLA chapters are helping the March of Dimes fulfill their mission. Berrien Middle School FBLA members sold lemonade and cookies to support the March of Dimes.